While Disaster Blaster does Fire Damage clean up and repairs, we certainly want to help prevent fires if possible. Dryer fire prevention is possible by following some easy tips. For most people, the clothes dryer is an invaluable appliance that allows them to keep up with what seems like a never-ending supply of dirty laundry… But what many people don't realize is that clothes dryers can be a leading cause of home Fires, accounting for 15,000 fires per year. Dryer fires can result from a buildup of lint in the lint trap or dryer vents, creating the potential for the dryer to overheat, or the collected lint to ignite. Often, this goes unnoticed until significant smoke and fire damage has occurred. As a result, it is recommended that regular cleaning and maintenance be performed to prevent a lint buildup in the dryer vent, lint trap, and behind the dryer. Common signs that a dryer vent may require cleaning include lint buildup on the sides or behind the dryer, longer dry cycles, and diminished performance. When concidering maintenance of your dryer, you should plan a schedule that ensures that the dryer is checked regularly so that lint buildup can be addressed timely. Doing so is important as things like a kinked dryer vent hose can cause lint to build up quickly. If your dryer hose is not the current metal exhaust hose now required by code, it is strongly recommended that you replace this with a new metal exhaust hose immediately, as they are much safer. When checking your dryer, be sure to pull it out and check for lint collecting around outlets, in any intake vents or screens, and in the cases of stacked washers and dryers, between the units. As dryer lint is incredibly flammable, you will want to remove as much lint as you are able to prevent risk of fire. In cases where you may be unable to get to areas where you can see (or suspect) lint is collecting, you will want to contact a Mantenance Professional that will be able to do this for you. While lint buildup is the most common cause of dryer fires, other causes include flammable objects stacked around the dryer, or electrical issues. Keep in mind that the dryer does generate a great deal of heat, and will need some "breathing room". 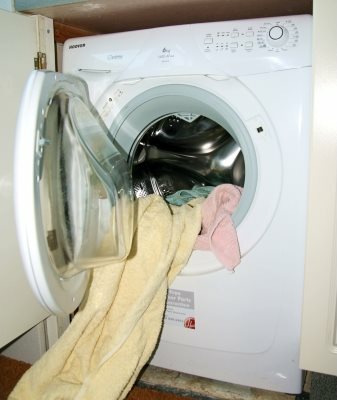 Items should not be stacked or kept too close to the dryer, particularly flammable items. In the event that you have breakers tripping, consider this a sign of potential electrical issues, either with the dryer unit or the household electrical. Leave the breaker tripped and contact a Licensed Electrician or Authorized Appliance Repair Center in order to determine the issue and have it resolved safely. • The U.S. Consumer Product Safety Commission (CPSC) estimates that 15,500 fires associated with clothes dryers occur annually. These fires account for an average of 10 deaths and 310 injuries and more than $84.4 million in property damage each year. Here is a great news segment discussing the dangers and tips for avoiding a dryer fire! We hope that you found this information helpful! If we can be of assistance in any way, please don't hesitate to Contact Our Offices!